Director John Vreeke has a genius for taking dense, accreted material and spinning it into something unexpectedly magical and immediate. Last summer, he did it with the Washington Shakespeare Company's transcendent production of "Lady Chatterley's Lover," a novel remembered by everyone for the scorchy parts, although it's really D.H. Lawrence's hothouse diatribe on stifling class distinctions in 20th-century England. At Baltimore's Everyman Theatre, he took the exposition-laden comedy "Red Herring" and made it into a slap-happy, commie-hunting 1950s farce that was as snappy as a Mickey Spillane potboiler. Now Mr. Vreeke has done it again, this time for Woolly Mammoth and Theatre J, with a wrenchingly affecting and beautifully acted production of Tony Kushner's "Homebody/Kabul." As theater mavens already know, Mr. Kushner never met a monologue he didn't like, as evidenced by the eight-hour masterpiece "Angels in America," which gave the phrase "Faulkner-esque" a whole new meaning. His love of language is evident and infectious, and the nearly four-hour "Homebody/Kabul" introduces us to such obscure morsels as "antilegomenoi" (volumes of cast-off or forgotten knowledge) and "periplum" (a word coined by Ezra Pound to describe a tour that takes you round, then back again), among others. Mr. Kushner also imparts a historian's delight in world history. Even if you believe your college lecture days are long behind you, you have to admire the playwright's audacity for starting "Homebody" with a one-person sirocco of a speech that whips you through thousands of years of Afghanistan's upheavals in little more than an hour. 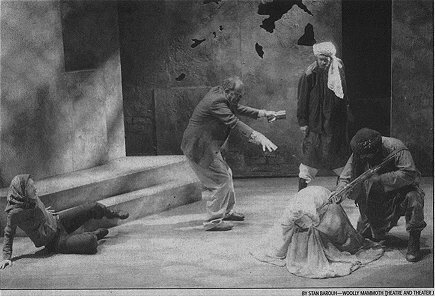 The play begins in 1998 with the Homebody (a charmingly distracted and gracious Brigid Cleary), an eccentric and bookwormy Englishwoman, sitting in a chair surrounded by a crescent of recently purchased Afghan hats. The story of these hats, bought for a party, leads the Homebody through a richly convoluted monologue that touches on the Taliban, Islam, anti-depressant use, unhappy modern marriages, reading and the wide gulf between the words "maybe" and "do." An old travel guide leads her to an impetuous trip to present-day Kabul, an act that sets the play in motion. The gorgeous torrent of language and the in-love-with-words penchant Mr. Kushner displays aside, the most potent aspect of "Homebody/Kabul" is its characters. They are a striking assemblage, ranging from a former librarian (Jennifer Mendenhall) nearly driven mad by the Taliban's restrictions on women; to a fetchingly dissolute British consul named Quango Twistleton (Michael Russotto), named after a character in a P.G. Wodehouse novel; to a guide (Doug Brown) who may or may not be smuggling terrorist secrets on documents he says are poems written in Esperanto; and a former Afghan actor (Aubrey Decker) who speaks in snippets of Sinatra songs and other forbidden pop-culture references. Mr. Vreeke skillfully handles this panorama of human behavior, enabling the actors to create vivid, brief sketches without resorting to stereotype. He saves the big guns for the main characters, though, starting with Mr. Foucheaux as Milton. Every scene in which Mr. Foucheaux appears — including a hung-over showdown with his volatile and fragile daughter and one in which Quango silkily introduces him to heroin — crackles with honesty and a terrible beauty. No one does mute vulnerability like Mr. Foucheaux, and he is ably matched by Miss DeSanti as the strident Priscilla. Where Mr. Foucheaux is all quiet composure and observation, Miss DeSanti is angry response and physical rejection. Mr. Russotto also has some disquietingly sensual moments playing the lonely, erudite junkie, as does Mr. Decker as the culture-hungry former actor. Miss Mendenhall's strident portrayal of the librarian jars at first, before settling down into a searing performance. Before August 1998, before President Clinton ordered the United States to retaliate against a Taliban-controlled Afghanistan by bombing the city of Kabul, and before the words Al-Qaeda and Osama bin Laden became reluctant fixtures of the collective American conscious, an annoyingly literate British housewife sits in solitude, reviewing passages from an outdated travel guide on the remote, exotic landscapes of Afghanistan. 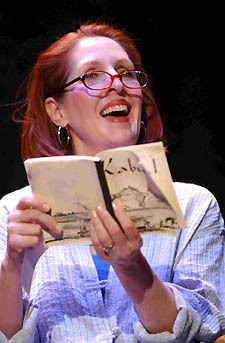 She is Mrs. Ceiling, "The Homebody " in Tony Kushner’s Homebody/Kabul, and she is ready for exquisite adventure. The estranged Ceiling family -- father Milton and daughter Priscilla -- dash off to Kabul in search of their missing wife and mother. Here in this devastating, mysterious country, far from the comforts of their London home, they are first told that Mrs. Ceiling died in a minefield while searching for the Grave of Cain, Adam’s first son. But soon thereafter, Priscilla discovers that the truth may be far more difficult to bear. There are rumors that The Homebody has abandoned her former identity and converted to the Islamic faith, marrying a Muslim in Kabul and forging a new persona. It is impossible news to imagine, that a citizen of the free world would betray her own culture, her carefree way of life, to assume the burdens of a oppressed woman in Afghan society. Is it possible that a self-indulgent Westerner could willingly sacrifice their freedoms, their very identity, to become someone else, to embrace and assimilate to a culture and religion so far removed from their own? It’s a difficult question to ask, but one that is perhaps even more awkward to answer. Tony Kushner, best known for Angels in America, has never been afraid to tackle some of the most controversial and convoluted issues of our time. Kushner started writing Homebody/Kabul in 1999, before American history became forever altered on September 11, 2001. 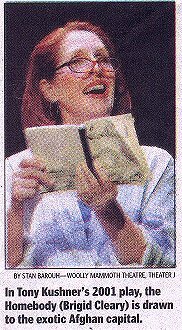 The play has since undergone significant rewrites since its December, 2001 New York premiere. Kushner’s latest version is a dreadfully long marathon, the length of which would be forgiven if the playwright were able to keep his audience engaged and interested. Instead, his long-winded lyrical speeches and never-ending scenes make for a grating theatrical experience. It’s an important, enlightening story, but it does not entertain and rarely enthralls. In fact, it is just plain difficult to digest. Perhaps the evening begins on the wrong foot. For a large portion of the first hour, The Homebody (Brigid Cleary) does not move from her garden chair, reciting an endless monologue as a lonely intellectual who finds old travel guides "irrelevant and irresistible. " Her curiosity for foreign lands and passion for ancient history should be endearing, not irritating, and her frequent asides leave room for us to empathize with her familiar boredom. Although Kushner’s material sounds amusing, Cleary’s stock delivery with its muffled dialect fails to delight. Once we arrive in Kabul in the second act, the play gains momentum, shaping a much different, darker story. Director John Vreeke successfully conveys a shadowy, volatile society filled with civil conflict and political intrigue, in part attributed to the inspired lighting design from Colin K. Bills. Kushner’s characters speak in native Pashto and Dari languages, which sharply contrast the varying degrees of Cockney demonstrated by the Ceiling family. These subtle nuances are brought to life through Vreeke’s precise details, including uncomfortable, violent moments that are rarely believable in a staged environment. Aside from Cleary’s lukewarm title character, the actors are uniformly solid, with exceptional supporting performances from Doug Brown, Michael Russotto, and Jennifer Mendenhall, emotionally wrenching as a desperate librarian who can barely remember the alphabet. Reciting a fluent mix of several languages, Mendenhall is the real revelation in an evening of burqa-clad anonymity. Like two polar cables trying to connect to the same dead battery, Rick Foucheux and Maia DeSanti offer affecting portrayals as a father and daughter helplessly trying to remain intact while everything around them falls apart. Foucheux is especially adept at mixing a peculiar cocktail of apathy and horror for his bumbling Milton. Sometimes it takes a personal, self-examining journey to understand what a particular piece of theatre is really about. After Kushner’s nearly four hour-long Homebody/Kabul, the audience is ultimately left to decide for themselves whether they have just witnessed an exposé under the guise of commentary on East-West politics and culture, or if the "spectacle of suffering " presented lends meaning and depth to the argument that it is possible to become so disenchanted with familiarity, freedoms and all, that one can be willing to shed their skin for life in a vastly different world. Copyright © 2004 Washington Free Weekly Inc. When Woolly Mammoth and Written by Tony Kushner. and Theater J announced that this season would see a collaboration on Tony Kushner's latest play, theater lovers throughout the Potomac Region took notice. Expectations were high, for here was a play by the man who wrote the emotionally smashing Angels in America, which all reports indicated was a perfect match for Theater J's sensitivity to the moral issues raised in that war torn quadrant of the earth and Woolly Mammoth's proclivity to treat the unusual with energetic flair. No one need fear disappointment - the results on stage meet the high expectations. The show is as rich and varied as had been hoped. It may not supplant Angels in America as Kushner's masterpiece, but it provides a night of fascinating, absorbing and memorable theater. Storyline: An English lady, unhappy in her marriage and not too thrilled with her relationship with their daughter either, becomes fascinated with an out of date tourist guide to the Afghan capitol of Kabul. Suddenly, she's off to the mysterious middle-east where she disappears into the Taliban-controlled closed culture of that poverty ridden but proud country just as the Americans bomb a suspected terrorist camp in Kkhost. Her husband and daughter travel to Kabul to find her. The husband believes initial reports that she had been killed but her daughter travels deep into the back streets of the city in search of the truth. The key item in the title is the slash, for there really are two plays here joined at the heart. The first hour is a solo performance piece, fascinating on its own merits but immeasurably enriched by what follows, and what follows is significantly enhanced by what precedes it. One of Kushner's incredibly personal personalities, the English lady known as Homebody, is brought to vibrant life by Brigid Cleary. She's all alone on the stage but not all alone in the room for she draws the entire audience into communication with her. Cleary reacts to the audience's reactions to her statements, turning a monologue into a conversation. (It helps that the house lights which are faded to black when the stage is darkened to start the show are brought back up to about a third so the audience isn't in the dark and it appears that Cleary can, in fact, see them.) Her presentation of the portions of the guide book that so fascinate her character is peppered with self-revealing asides, salted with the kinds of additional information that a woman who loves to read would have stored in her brain and sweetened with an enthusiasm for life that makes you awfully glad you met her. The Kabul part of Homebody/Kabul - the part that is populated with a host of intriguing characters - is not quite as uniformly satisfying as that first segment, but it is never less than fascinating and occasionally spellbinding. The spellbinding part comes late in the evening when Jennifer Mendenhall makes her appearance as an Afghan woman wanting to leave the country because her husband wants to take a new wife. Her tantrums are enough to make you believe her husband would want to be rid of her under any circumstance, but watch closely for they are so skillfully modulated that they ingratiate rather than repel the listener. This is a trick that Maia DeSanti as Homebody's daughter hasn't quite mastered. Her whining outbursts, as well motivated as they are, become tiresome and seem petulant when her character certainly has a great deal to whine about. In between the two extremes are a number of fascinating individual portraits including Doug Brown as an inscrutable guide/poet, Aubrey Deeker as an Afghan who loves the lyrics of Sinatra songs, Conrad Feininger as an infuriatingly logical Mullah and, most notably, Rich Foucheaux as the husband who may not have cared a lot for Homebody in the waning era of their marriage but whose fate all but destroys him. The world which Homebody's family searches is confined in but strikingly staged on Lewis Folden's earthen toned set given depth, suspense and dramatic emphasis through Colin K. Bills' effective lighting design and Dave McKeever's haunting soundscape of the backstreets of Taliban-held Kabul. The fine thing about the visual and aural design is it remains a background for the actors as they create the characters out of Kushner's words, but it seems to amplify them - not in volume and not in any audio augmentation sense, but in the way they frame the moments, add depth to the spaces between characterizations and provide the audience with a sense of the feel of backstreet Kabul. It's quite a trip. In "Homebody/Kabul," playwright Tony Kushner gives himself a tough act to follow. For the first hour of this absorbing exploration of broken hearts and shattered nations, we're in the thrall of the Homebody, a hilariously literate Englishwoman with a desperate urge to flee the suffocating normalcy of life in London. Through her restless imagination, she has already begun her escape, and as she reads on and on to us from a frayed guidebook to the Afghan capital, her relish for the exotic, faraway city becomes infectious. She makes it sound mysterious and alluring, another Casablanca. In Brigid Cleary's smashing performance, the Homebody is irresistible, too, vivacious and wounded and balmy and comic, a character so vivid that you're not inclined to encourage her to yield the stage. The marvelous hour in Cleary's company is a whole play unto itself. That 21/2 additional hours of exposition are to follow is the tricky assignment Kushner must navigate in "Homebody/Kabul," the 2001 play receiving its Washington premiere from Theater J and Woolly Mammoth. To the extent that the Homebody's aura lingers long after she has vanished, the work retains an emotional force. The panic at her disappearance in Taliban-controlled Kabul, where her husband, Milton (Rick Foucheux), and daughter Priscilla (Maia DeSanti) go in search of her, feels authentic. But it's also the case that "Homebody/Kabul" grows murkier and less interesting the further it strays from an accounting of her fate. (The play, it should be added, is never uninteresting.) It's only in the emergence later on of an Afghan character, a tormented wearer of the burka (the gifted Jennifer Mendenhall) who has her own urgent need for escape, that the play regains its powerful hold. The other pivotal theme, the troubled Priscilla's quest for peace with her mother and with herself, is as shrill and overindulged as the mystery of the Homebody is fascinating. At the time of its opening three years ago at the New York Theatre Workshop, "Homebody/Kabul" was Kushner's most ambitious work since the Pulitzer- and Tony-winning "Angels in America." "Caroline, or Change," a musical memoir of race relations in Louisiana that is moving to Broadway next month, may now own that distinction. "Angels" was the playwright's wrath-filled elegy to an America in the grip of AIDS. "Homebody/Kabul" is also concerned with grief, the despair at the loss of a loved one, of a culture, of identity, of personal freedom. Like "Angels," too, it's a grab bag, a story assembled from a passel of perspectives. But fewer of the perspectives in "Homebody" muster any real intensity. The Afghan voices, in particular, do not always fulfill the dramatist's mandate for radiant individuality. Kushner has tightened the work since its New York debut, and as a result of John Vreeke's taut mounting on the compact Goldman Theater stage in the DC Jewish Community Center, the production usefully sustains an air of unease. The casting of some of the Afghan roles is questionable -- the shifty-eyed Taliban minister of Conrad Feininger, for instance, comes across as a B-movie sinister guy -- and too many attempts are made by too many actors to show off in their freak-out "moments." Still, an American playwright of Kushner's skill and passion taking on the geopolitical tragedy of Afghanistan could not make for an evening of more consequence. Set in the late 1990s and written before 9/11, "Homebody" is like a tour of ruins -- in this case, the rubble left by 3,000 years of steamrolling conquerors and superpowers. The Kabul extolled in Cleary's guidebook bears little resemblance to the armed camp it has become under the Taliban. 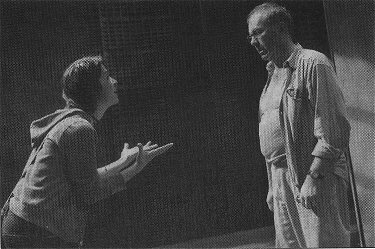 Lewis Folden's set of stone and metal fencing, lighted ominously by Colin K. Bills, conjures a colorless combat zone. The only visual relief comes from an unlikely source, the splashes of color sported by the Afghan women in burkas; as designed by Helen Q. Huang, the costumes are made to seem heavy, ungainly, a burden. Much of the plot revolves around Milton and Priscilla's efforts to unravel the mystery of the Homebody's disappearance. Foucheux's Milton is a finely wrought puddle of a man: sobbing and cowering in his hotel, he withdraws into a solipsistic heroin-fed stupor, assisted by Quango (Michael Russotto), a British expatriate so debauched he rifles Priscilla's backpack for knickers to sniff. It is left to Priscilla to venture out and try to find the truth, a quest that leads her to Khwaja (Doug Brown), who may or may not simply be the mild-mannered, Esperanto-spouting poet he claims. Kushner leads us from the lush, cerebral world of the Homebody to the scarred, barren landscape of Kabul so that we, too, can feel the loss of what Milton and Priscilla had and never appreciated. Priscilla, however, is such an unpleasant mess -- embittered, hostile, arrogant, unbending -- that it's difficult to accept her as a touchstone for the play. Though DeSanti conveys Priscilla's pique convincingly, in defiant drags on a cigarette and little foot-stomping tantrums, she has little more success in opening Priscilla up to us than have other actresses in the role. Much more accessible and rewarding is Mendenhall's Mahala, an urbane woman who has not borne the years of intellectual deprivation at all well. Once a librarian -- like the Homebody, she's obsessed with books -- she has been driven to the edge of madness by the strictures of misogynistic religious rule. Mendenhall finds the vulnerability in Mahala, and the fury; her anger is as palpable as Cleary's joie de vivre. What Vreeke's production makes so admirably clear is the bond these confined women, gasping for new life, share. 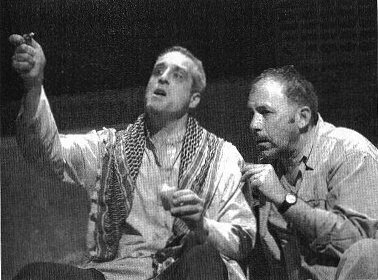 It's the most vital link in the play, the one that most persuasively justifies the backslash in the title: in Mendenhall's Mahala, a Homebody can truly be found in Kabul. 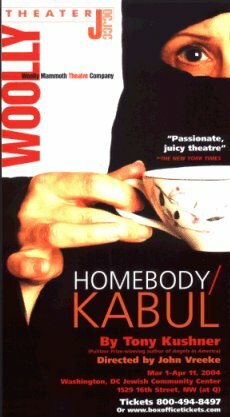 Homebody/Kabul, by Tony Kushner. Directed by John Vreeke. 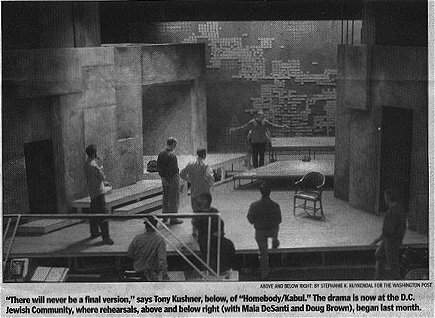 Sets, Lewis Folden; lighting, Colin K. Bills; sound, Dave McKeever; costumes, Helen Q. Huang. With Michael Kramer, Ted Feldman, Aubrey Deeker. Approximately 3 hours 30 minutes. Through April 11 at Goldman Theater, DC Jewish Community Center, 1529 16th St. NW. Such a torrent of words to wash over us! Such a polymath spate of untranslated Pashtun, Dari, French, and Esperanto, and yet all is understandable. Such a river of wailing, of keening. The Homebody disappears to Afghanistan and the scene shifts from London to Kabul in 1998, where her family are seeking her. 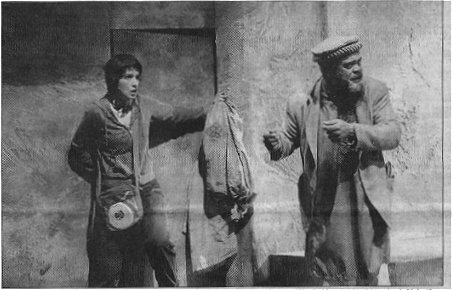 While her husband Milton Ceiling (well-played by Rick Foucheux) rarely stirs from his hotel room, her daughter Priscilla finds a Tajik guide, Khwaja Aziz Mondanabosh, portrayed with sly dignity by Doug Brown. The Ceilings eventually return to London with something more than they left with, and something less. Colin K. Bills mounts lighting instruments on the floor so that much of director Vreeke's inventive action can take place lying, sprawling, kneeling on the deck. The play takes us on a trip, but refuses to lay out tidy lessons for us. We're left a little adrift, wandering down a ruined street.